The uncanny valley hypothesis posits that when robots and other human facsimiles look and act almost like humans, it causes a response of revulsion among human observers. 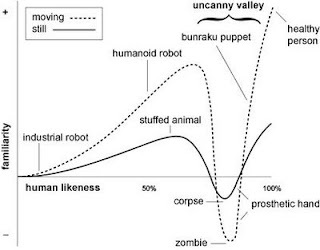 The “uncanny valley” refers to the dip in the graph of the positivity of human reaction as a function of a robot and other human facsimiles’s life-likeness (see below). Hypothesized emotional response of human subjects is plotted against anthropomorphism of a robot, following Mori’s statements. The uncanny valley is the region of negative emotional response towards robots that seem “almost human”. Movement amplifies the emotional response. Photo from Wikipedia. It is the reason why we prefer cartoon characters than CGI characters that look realistic. 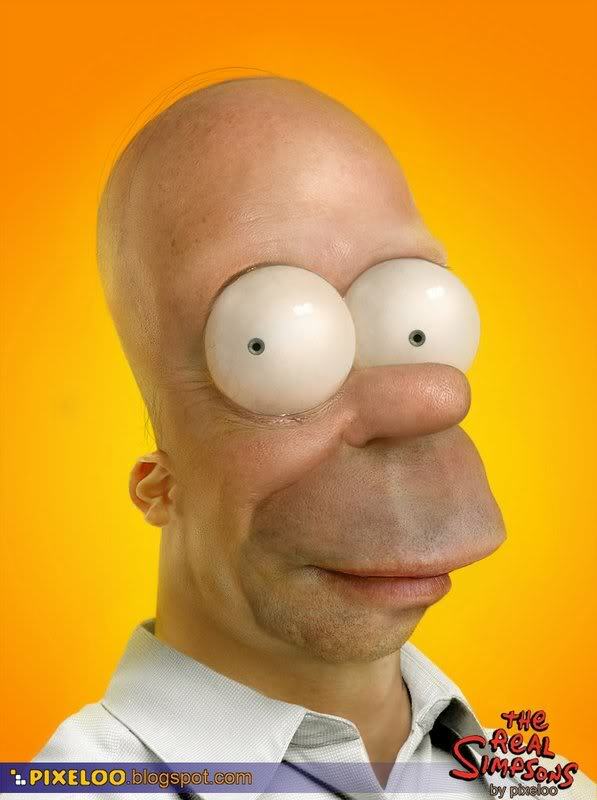 For example, you are more likely to like the cartoon version of Homer Simpson than the “realistic” Homer Simpson. Read about the uncanny valley hypothesis here. Now this is the interesting part. Using long-tailed macaques (Macaca fascicularis) as test subjects, Steckenfinger and Ghazanfar (2009) found that these monkeys’ visual behavior actually fell into the uncanny valley, which mirrors the behavior of humans. These macaques looked longer at real faces and unrealistic synthetic faces than realistic synthetic faces. The unrealistic synthetic faces, realistic synthetic faces and real faces. Actual images used in Steckenfinger and Ghazanfar’s experiment. The authors did not conclude why the visual cues of these macaques fall into the uncanny valley, though they did suggest that it has an evolutionary basis. Remember the picture above? If not, read my blog entry on Contagious Yawning in Chimpanzees. I see you yawn. I wonder if those chimpanzees will yawn if given more realistic synthetic faces.